Sharon Hendrix has performed in over 8,000 shows and it’s only the beginning! Los Angeles - After years of working just 20 feet from stardom Sharon “Muffy” Hendrix is stepping into the spotlight. Throughout her successful career Sharon has been singing backup on recording sessions and performing on stages across the world with top names including Bob Dylan, Elton John, Tom Jones, Grace Slick & Starship, Olivia Newton-John, George Duke, Dusty Springfield, Freddie Hubbard, Natalie Cole, Harry Chapin, Jermaine Stewart, Mac Davis, Billy Cobham, Michael White, Shirley Bassey and so many other notable musical talents. Sharon Hendrix began her career as "Muffy" Hendrix singing in the church and school choirs and by the time she reached her teens she became part of The Young Americans, an international touring company of 30 singers from all across the country. Over the next two years Sharon toured the Far East twice, performed on the Ed Sullivan Show and the Kraft Music Hall and worked on various TV specials and commercials. Sharon earned a music scholarship to Chapman University and received her show business education on Las Vegas stages at the side of superstar entertainers including Debbie Reynolds and Sammy Davis, Jr.
Sharon formed a lifetime friendship and working relationship with Barry Manilow from the moment the beloved superstar called her to replace one of the singers in his back-up band. In 1985 Sharon recorded the popular, "Ain't Nothing Like the Real Thing" duet with Barry that appeared on his "Manilow" album as well as the Billboard charts. Currently Sharon is performing with Manilow on his worldwide "One Last Time!" farewell tour which brings us to now! 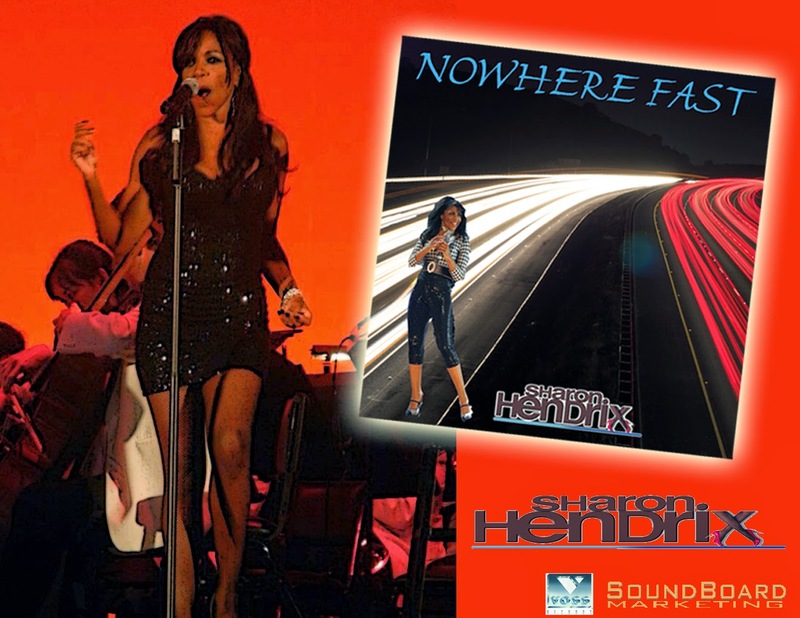 Sharon's completing her solo debut album which will be available in the fall from Voss Records and has just released the title track, “Nowhere Fast” as the lead single. Sharon co-wrote the song with her producer, Dan Voss Jr. and trumpet virtuoso Steve Madaio. Sharon’s smooth vocal style sits over a contemporary urban Latin beat spiced with exciting percussion, a classic horn solo and an infectious rap by William “June Bug” Lee. Between breaks in the Manilow tour the industrious Ms. Hendrix is finishing the new album as well as planning her solo career launch. Sharon’s been tirelessly rehearsing with her band working out arrangements on old and new tunes. When the tour ends this summer the Sharon Hendrix Nowhere Fast show will hit the road running and Sharon will be front and center exactly where she’s always been destined to be. When she’s not on the road Sharon lives in southern California and is the proud mother of three lovely daughters.